While getting a driver's license is an exciting rite-of-passage for teens, it can be enough to make a parent frantic. The Insurance Institute for Highway Safety (IIHS) and the Insurance Information Institute (I.I.I.) say there's something worried parents can do to protect their teens -- choose a safe vehicle. Sport utility vehicles, especially the smaller ones, are inherently less stable than cars because of their higher centers of gravity. Abrupt steering maneuvers - the kind that can occur when teens are fooling around or over-correcting a driver error - can cause rollovers in these less stable vehicles. A more stable car would, at worst, skid or spin out. Most of today's cars are better designed for crash protection than cars of six to ten years ago. For example, a newer, mid-size car with airbags would be a better choice than an older, larger car without airbags. 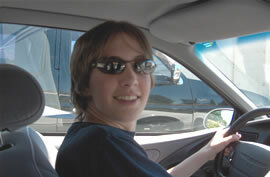 Before you make a final choice on the car your teenager will drive, consult the U.S. Department of Transportation (http://www.dot.gov/) or the Insurance Institute for Highway Safety (http://www.iihs.org/).